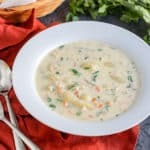 This Olive Garden Instant Pot Chicken Gnocchi Soup recipe is can be made in 30 minutes, and the flavour is simply outstanding. With chicken, stock, vegetables and spices combined to perfection - this is one soup recipe that is a perfect restaurant copycat. Using an Instant Pot, saute the diced chicken until cooked. Add the pepper, thyme, butter, celery and onions. Continue to saute until the onions are translucent then add the chicken broth and shredded carrots. Add the gnocchi and mix well, still on saute. Allow to boil until gnocchi is cooked. Add the spinach and cheese, and mix until spinach starts to wilt. Turn off the Instant Pot - serve hot and enjoy!